Creators Update has brought many new features and options to the ever-updating Windows 10 operating system. With Creators Update, Microsoft has tried to add some of the most requested features and options to Windows 10. The inability to control updates was one of the common complaints about Windows 10 ever since its general availability back in July 2015. With Creators Update, Microsoft has made it a little easier to control updates in Windows 10. Windows 10 Creators Update (version 1703) allows you to choose when updates are installed on your PC. Using the new settings available, one can delay or defer updates for up to 365 days. If you are running Windows 10 Creators Update (1703), you can delay security updates for up to 30 days. Likewise, you can defer feature updates to 365 days. For starters, feature updates are nothing but big upgrades released for Windows 10 to add new features and capabilities. Creators Update, Anniversary Update, and November Update are feature updates released for Windows 10 so far. Quality updates, as you likely know, released at regular intervals to improve stability, security, and performance of Windows operating system. You can delay quality updates for up to 30 days. However, bear in mind that, you cannot delay or defer updates for Windows Defender program. As always, these new update settings are exclusive to Windows 10 Professional, Enterprise, and Education editions. You might not see these options on Windows 10 Home edition. Here is how to defer or delay updates in Windows 10. Step 1: Open Settings app. Navigate to Update & security and then Windows Update. Step 2: Under Update settings section, click Advanced options link. This action will open Advanced update options page. 2. A feature update includes new capabilities and improvements. 3. A quality update includes security improvements. The first option allows you to choose between Current Branch and Current Branch for Business. Select Current Branch if you want to install a feature update as soon as it’s released to the general public. 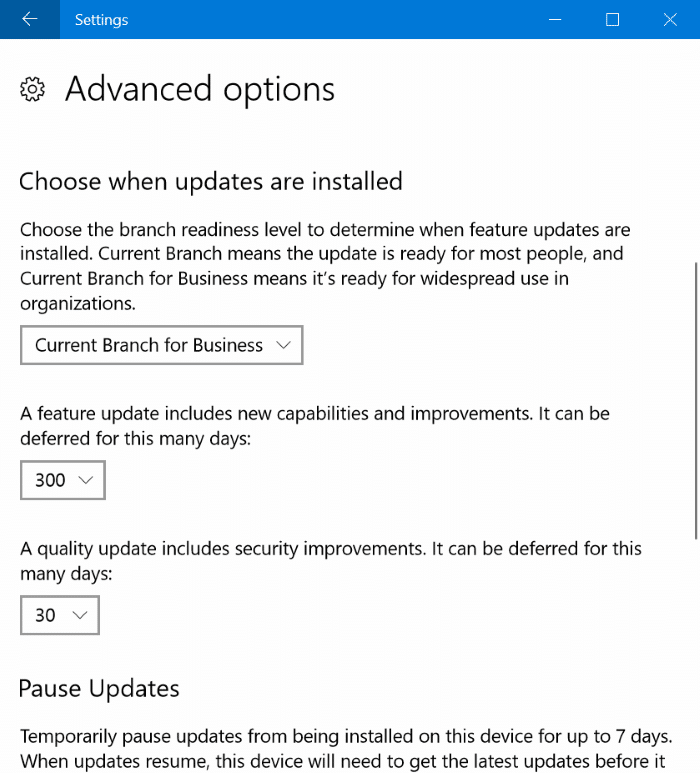 The Current Branch for Business is typically released a few months after a build is released for general public. Therefore, if you are a cautious user and are not keen to get your hands on new features, you better choose the Current Branch for Business. The second option allows you delay feature updates up to 365 days. You can choose any number between 1 and 365 from the drop-down box. The last option is for quality updates. You can delay it up to 30 days. Use this option when there are reports that a specific update is causing issues on Windows 10. Did you know that you can pause Windows Update in Windows 10? BYW – Please ask your ever-so-kewl kiddie-koders to use a font we can SEE when typing in this “Comment” box! Or are they opticians drumming up business? Like everyone else in the media the title of your article is misleading, I’m assuming unintentionally. This article is specific to Win 10 Pro / Business / Enterprise. But your title does not make the point. The article does include this the qualification, eventually … but it is buried in the middle of the article. Move the version declaration to the very top of the article, first para. Don’t make me go hunting for it. Is there any way to download older ISO’s?